Thosse pretzel treats sure look good and that's a cute little helper also! So wonderful to have such a special Tea with such a lovely visitor. Your snacks look so cute and I know she must have enjoyed them so much. How delightful for you and her to be able to enjoy some "girl time." You are creating so many special memories for the both of you. Happy Monday, my friend. Love and hugs! Oh she is so sweet! What a lovely party! Yum, your shamrock treats look wonderful. Ella is adorable. I like her choice of mugs! I'd give those treats two thumbs up, too! Happy Tea Day! What a fun post, Kitty! Your little granddaughter is a cutie-pie and those treats would not only be fun to make but tasty too, I'm sure. Perfect treats for the upcoming holiday. Love your shamrock tea things! What sweet memories you are making with Ella! Thank you for sharing and joining me for tea today. I agree, two thumbs up! What a cutie you have to share your tea. Ella is adorable. So cute! How fun to have tea with your granddaughter! Your pretzel treats are so cute, and I love the shamrock mug. Thanks so much for linking to Tuesday Cuppa Tea! Ella is adorable Kitty and I did notice her green nail polish and like it. The tea time treats look yummy and the china is perfect for a March tea. So cute, Kitty. Your granddaughter is adorable. Such a pretty shamrock tea all set to be shared with that adorable little helper! The pretzels look very yummy. I bet Ella loved them! What an adorable tea! The shamrock treats are too cute! Lucky you! And you are a peach like my grandma was :-) A great project for the kids. How cute Kitty! Cute granddaughter and table. The pretzels look so good- I like the simplicity of how they're made. this was certainly a fun for both of you. Such a cute teatime! Love the guests, the setting and the treats. Thank you for sharing this cute Tea Party. Little one is adorable. Loved your table. So adorable Kitty from your granddaughter and her nail polish to the bears at your table for tea time! The shamrock pretzels look like the perfect treat for St. Patrick's Day! 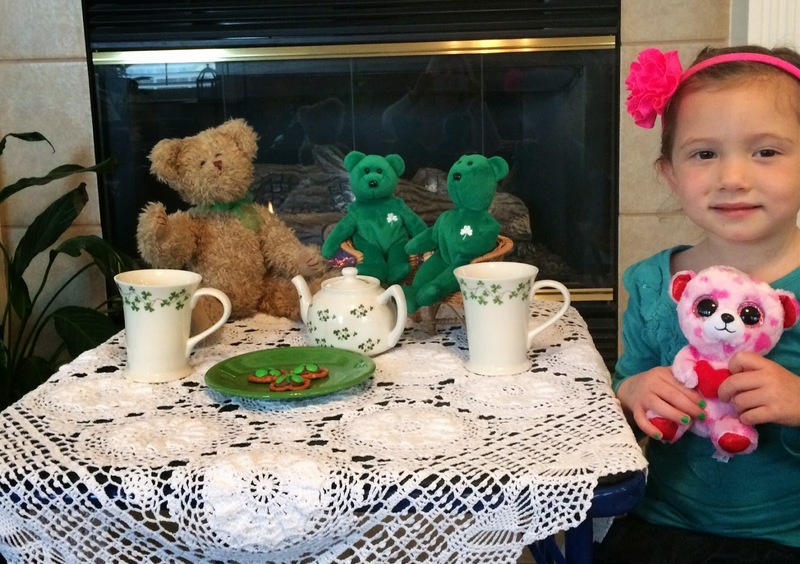 Sounds like you and Ella had a lovely St. Paddy's day tea! I love those mugs! I make pretzels like that for the holidays and I can't be left alone with them long. I vary the top, sometimes kisses, sometimes Rolo's. Now, I will have to make some this weekend! ha. Adorable. What precious memories you are creating for your grand daughter. Happy Tea Day! Adorable little girl! The treats are cute, too. Oh, Kitty, how cute! Your granddaughter is adorable, love those green nails. Those treats look like the perfect easy and delicious thing to make for teatime! Little Ella is just adorable! I like your teapot and mugs and your pretzels look good too! Oh my she is so cute. I too like your teapot. Super cute! Your granddaughter is a doll, and I ADORE that darling little teapot. Thank you for sharing! What a cutie she is that Little Ella! This is the perfect treat for children too! Thanks for sharing Kitty! Hope you have a great week. Ella is soooo cute, Kitty! And I'm so happy to see her and you enjoying tea and making treats together--aside from cuddling them, it doesn't get much better, does it?? I'll have to try your pretzels with our chickadees! Thanks for sharing! I'm so glad you shared this extra sweet post with Roses of Inspiration - thank you, my friend. Love to you! 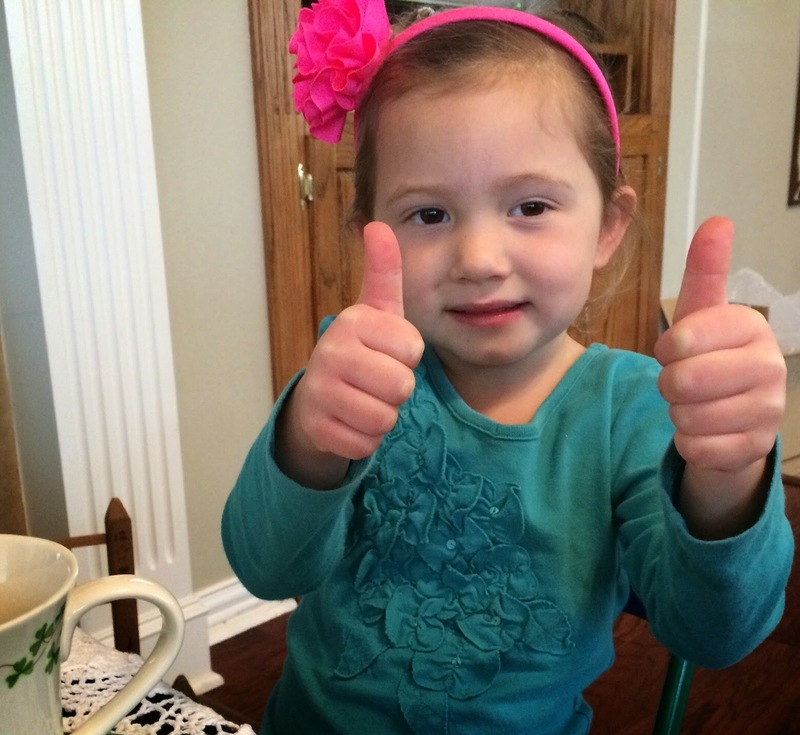 What fun to have tea with your sweet little Ella. This is a great idea, Kitty. It's a perfect kitchen project for little cooks. Happy St. Patrick's Day to you. How cute! It looks like you had a really fun day with your granddaughter. Have a great weekend! Ella is a doll and I love the little pretzel treats! What a fun time with grammy!! Thanks for sharing with SYC. Sweet st Patrick's day treat and even sweeter tea time table with Ella! One of my Great Granddaughters is named Ella, and your Ella is just adorable! What fun to have tea with your Granddaughter and your Shamrock Pretzel Kiss Treats look awesome. Happy St. Patrick's Day and thanks so much for sharing with Full Plate Thursday!